So, I’m organizing my life. Basically the system of keeping track of things all in my head no longer works now that I’m older and can’t remember things as well. I’m not sure if its because there’s just too many 80s song lyrics cluttering up the joint or if there’s some physiological reason. All I know is my memory is not what it used to be. Anyway, as part of my sorting all the crap I want to keep track of into an organized system, I wrote down all of the books on my “To Read” list both digital and physical into one place and sorted them into categories. 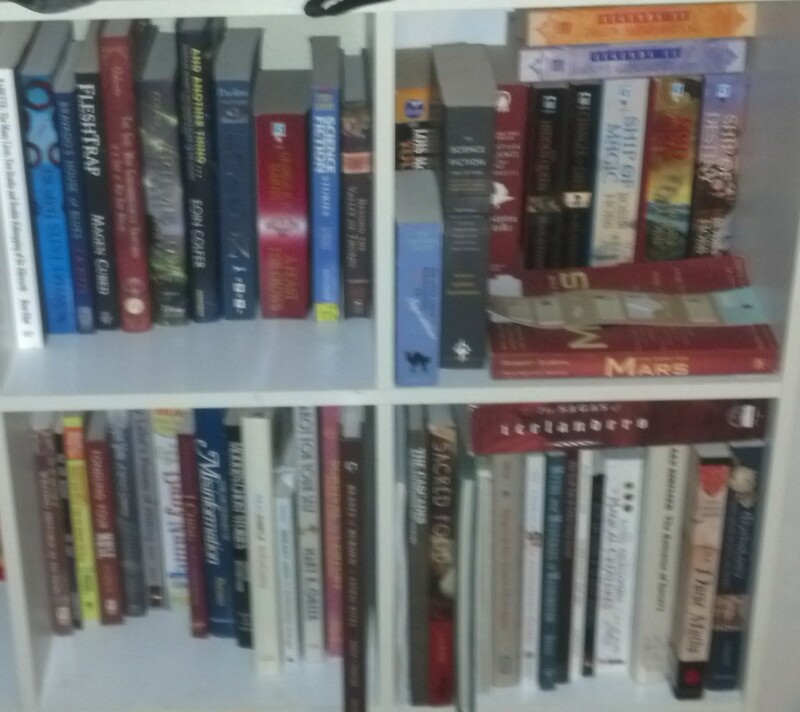 The first thing I realized is that not all of the books that I own and haven’t read are actually books I want to read. So I gave myself permission to sort out all of the books that are just “Own and Haven’t Read” from the ones I have personal or professional interest in reading. I then sorted the rest into these categories regardless of format. Wow. So… that gives me a lot of emotional responses. The first one is that is a lot more than I can reasonably read in a calendar year. I’d also guess that every reader I know over the age of 27 or so has a similar list of To Read. I’d imagine that most writers’ To Read Lists are worse than this (though I think a lot of us include the “Books I Own And Haven’t Read” in our lists either consciously or unconsciously). So, as a writer, when I send a novel into the world it is not just competing to be bought, but it is also fighting with a the To Read lists of everyone who purchases it. And this is the point in this thought process where I stop to silently scream. Ok. I am zen. *deep breath* So. Very. *grits teeth* Zen. Next on the list of mental hurdles to overcome are the 15 books by people I know. Like, the sort of people who would show up to my funeral not just retweet my death with a frowny face (though I appreciate all the frowny faces sent on behalf of my eventual demise). The most guilt inducing of all of these is a biography written by one of my very closest high school friends and I REALLY should have read it by now. I also feel guilt over the unread fiction magazines and anthologies. I feel that I should be up to date, or at least close to it to really know what the short story market is about. I can’t possibly call myself well-read in genre if I have that much on my To Read. There are lots of really important stories I should know in there. This is professional guilt, social guilt (as there are lots of people I know relating to short stories too), and personal guilt because I WANT to be better read and up to date in short fiction. Research is probably the only stuff I feel really in control of and know exactly what I need to read, how important it is, and have an actual plan to read a good portion of it. I can probably safely not think about the books on the “To Read Someday” and “General Inspiration” at least for the moment. That leaves me 160 items on my active To Read list. I have no hope of the list remaining static (I subscribe to too many magazines for one). But for my own personal sanity I need to come up with a plan to do better. So, I wrote myself the following “rules” to try to do better. Rule 1: Don’t read books you decide you don’t actually want to read even if you’ve already started them. There’s no way you’ll actually get to the books you want to read if you force yourself through stuff you hate. It’s ok to not want to read stuff. Rule 2: Cheat. It’d probably feel pretty good to knock out a few of these as soon as possible. Read a bunch of short ones first. Rule 3: Time. Schedule more time in the week to work on reading short fiction. The one story a day thing is great, but it doesn’t keep stories from building up if you don’t knock out a good chunk every week on top of that. Rule 4: Manage Guilt. Try to read the most guilt-inducing stuff first but be sure to reward yourself with stuff you want to read on a regular basis. Rule 5: Death. Remember you’re never going to get to the end of this list. If you do, it’s only because you’re dead. I recently realized that I’ve let my reading fall too far behind. There’s always a balancing act with writing and reading. I’ve basically stopped playing immersive video games. There are no current TV shows I’m following (though I am looking forward to season 3 of Korra). I still play puzzle games, and watch streaming shows, but those are things that happen on my terms. Reading has to be balanced with writing time, and it’s hard not to feel guilty about one or the other. If I’m not reading, my writing can’t advance. I know that. There are some things you can only learn by reading and some things only by writing. I’m holding myself back by not reading enough. I decided to start rebuilding my reading habit by working primarily on reading short stories. To give myself a Master Class in genre short storytelling both present and classical. To do this, I need to also analyze the short stories in some form. I dislike doing in-depth fiction reviews, especially when there are intangible things like emotional impact and voice involved. Since I’m doing this for my own benefit I decided to go with a 1-5 star rating. * = has potential but has technical, cultural, or voice problems. *** = Good story, I see it as publishable quality even if it didn’t work for me. ***** = I would nominate/vote for this story. Excellent quality, builds a full world, drags you into it for the full duration of the story and leaves fingernail marks on your soul. I think this will be an ongoing thing for a while, and in a few months I will go back and do more analysis of the 5 star stories. I’m at the point right now with my writing that I pretty much know what NOT to do, I just don’t always succeed with what I was trying to do. So it makes more sense for me to focus on the top-tier of stories and figure out why stuff knocked it out of the park. I was a little surprised to realize there wasn’t really a correlation to how much I enjoyed reading the story and if I gave it 3 or 4 stars. There were 4 star stories I did not enjoy at all and 3 star stories I greatly enjoyed. There were even a couple 2 star stories I really liked and enjoyed. The difference between two and three stars in some cases was asking myself, “If my name was on the cover as editor and I had a slot this story would fit, would I have published it as is?” The ones I said, “Yes” got 3, the others got 2. I’m only reading published stories for this, so my opinions might be different if I was finding some of these stories in slush. There were a lot of stories that didn’t work for me that still rated 4 stars. As a result of this, I of course had to rate my own published works on this scale. Most of them were in the 2 to 3 range, with one maybe 4. 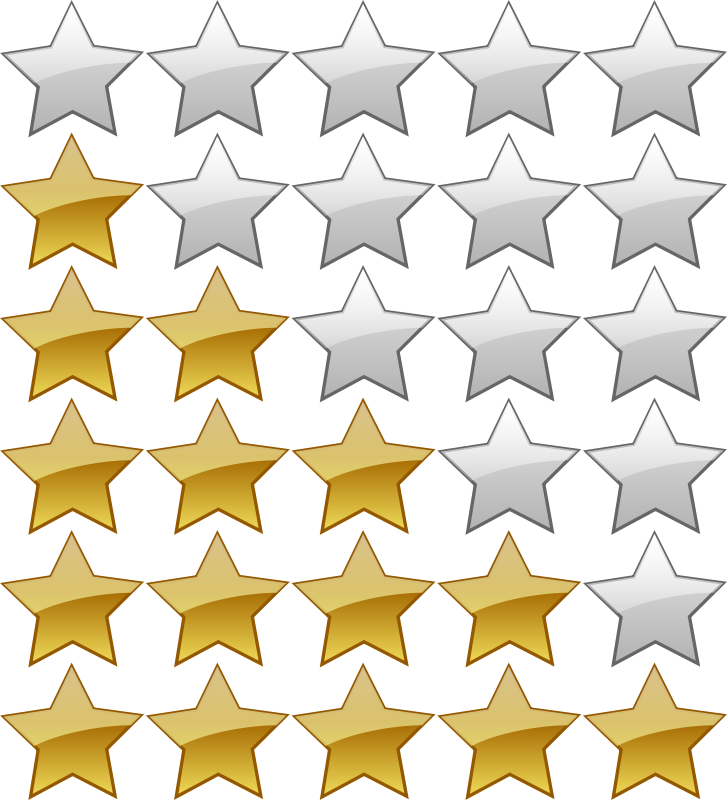 I have not written a 5 star story yet. Not by my own scale anyway. That’s a very motivating thought. Anything that makes me want to get better and write more is something I need to keep doing. I think I’ll periodically put up a post with this same breakdown in it, and any thoughts I’ve dredged up in the process. What do you think?